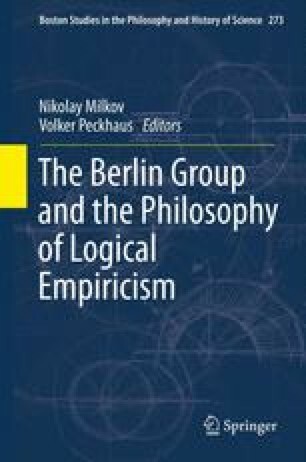 This chapter concerns the philosophical and personal interactions between the Neo-Kantian philosopher Ernst Cassirer and two members of the Berlin Group, Kurt Lewin and Hans Reichenbach. Both Lewin and Reichenbach were students of Cassirer’s in Berlin, and both explicitly discuss Cassirer’s work in their writings. After some biographical material drawn from their published and unpublished works and correspondence (Sect. 4.1), Sect. 4.2 of the paper argues that each of the three shared a broad conception of philosophy as the “logical analysis of science,” though each carried out this project in different ways. Lewin used philosophical ideas from Cassirer to motivate his original and consequential research program in experimental psychology (Sect. 4.3). Reichenbach, on the other hand, initially drew on Cassirer’s theory of the a priori in isolating a priori “coordinating principles” in general relativity, and then later rejected Cassirer’s theory by relabeling these principles as conventions (Sect. 4.4). That Cassirer did not follow Reichenbach into conventionalism springs, I argue, from Cassirer’s rejection of Reichenbach’s view that theory-neutral experimental measurements could ground physical theories in an objective way. This paper greatly benefited from comments and conversations with Flavia Padovani, Erich Reck, Thomas Ryckman, and Audrey Yap. I also owe a special debt to Nikolay Milkov for first alerting me to Lewin’s relationship with Cassirer and the Berlin Group.